Your baby will go wild visiting this exciting jungle and all its fun activities! A rotating seat gives little ones 360-degree access to toys, activities and animal friends, including spinners, clackers, a bead bar, a mirror, and so much more. Tiny explorers will love discovering all the fun while music, lights, and sounds reward every jump.Where development comes into play; Gross Motor: Jumping, balancing on those tiny toes, and reaching for all the toys & activities helps get your baby's gross motor skills going and growing! Sensory: Bright colors, lights, and a variety of sounds and textures help stimulate your baby's visual, auditory and tactile senses. Curiosity: There's so much for your little explorer to discover—from the animal pals "flying" above to their own sweet face in the mirror below! Use only with a child who can hold head up unassisted and who is not able to walk or climb out of product. 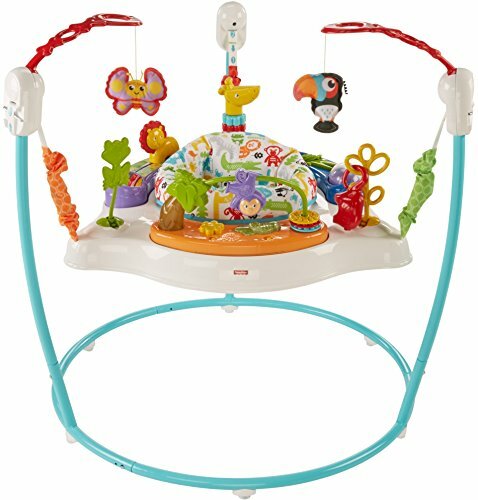 360 degrees of play for baby to discover! Colorful toys include bat-at butterfly & toucan, giraffe with spinner-bead neck, froggy teether, lion slider & more! View More In Activity & Entertainment. If you have any questions about this product by Fisher-Price, contact us by completing and submitting the form below. If you are looking for a specif part number, please include it with your message.